The Glock 19 is one of the popular weapons in the world and is by far the popular Glock model. The Glock 19 is considered a compact handgun but is no pocket pistol. The Glock 19 is a reliable, accurate, and capable pistol plagued by one large problem, it’s sights. The Glock 19 sights, and Glock sights, in general are not the weapon’s strong point. They are plastic, they feel cheap, and they are impossible to use effectively in low light situations. What’s one to do? Upgrade of course. The Ameriglo Pro I Dot sights are an interesting and dynamic set of sights designed to accommodate both day and night shooting. 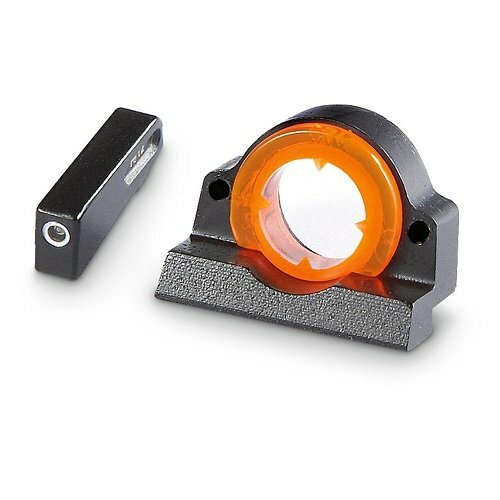 The Ameriglo front sight uses a combination bright orange circle around a glowing night sight insert. The orange outline is for use during the during the day where the glowing insert is useless. The glowing insert is of course for night shooting. The rear sight features a simple glowing dot at the bottom of the rear sight, and this dot is surrounded by a white ring for daytime shooting. There is no reason one has to compromise between high vis day sights and glowing night sights. These sights are for self-defense, and make the weapon a great choice for concealed carry, or night stand home defense duty. The sights are designed to be placed over your target, not directly underneath, and this may take some range time to get used to. Overall they are a good option for the Glock 19. 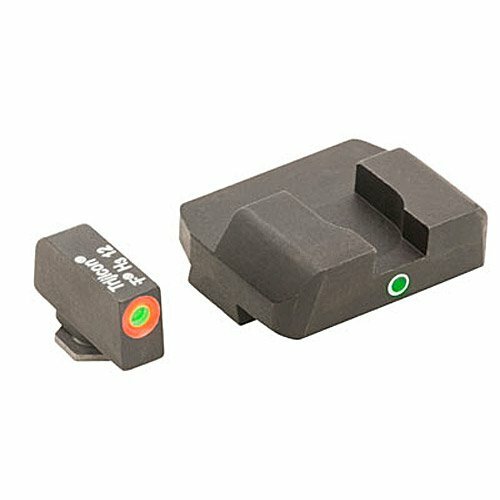 Designed for rapid target acquisition the XS 24/7 big dot sights are made to be used as self-defense sights. The front sight is very large and very easy to see. The XS big dot is designed to allow the shooter to get sights on target as rapidly as possible. The front sight has a copious amount of white paint applied to make the sight eye catching when the gun is brought to bear. The XS 24/7 derives the second portion of its name from the fact the sights can be used in both day and night situations. The front dot has a small tritium insert placed in the middle of it that glows brightly in low light situations. The rear sight has a tritium insert in the middle of the rear sight as well for proper sight alignment. These sights are designed for combat, and not designed for target shooting. The large front sight may obscure a traditional bulls-eye target. However, as a combat sight they are hard to beat. 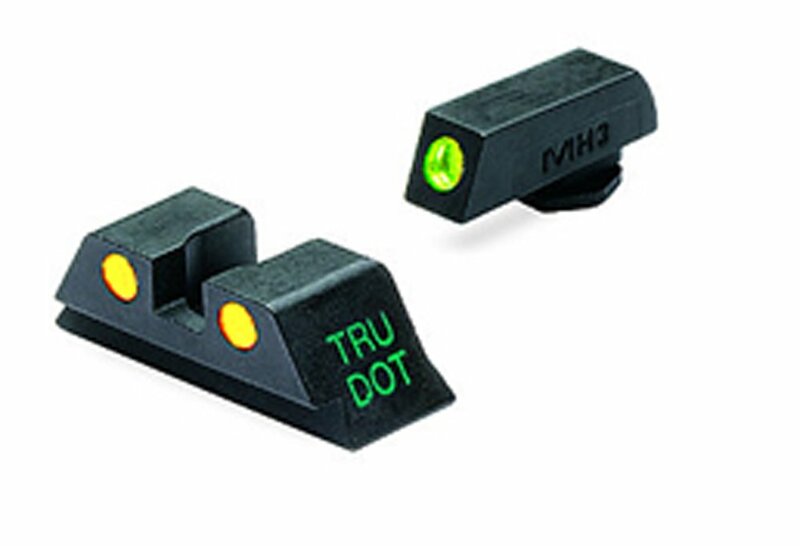 The Meprolight Glock Tru-Dot night sights are the absolute brightest night sights on the market. 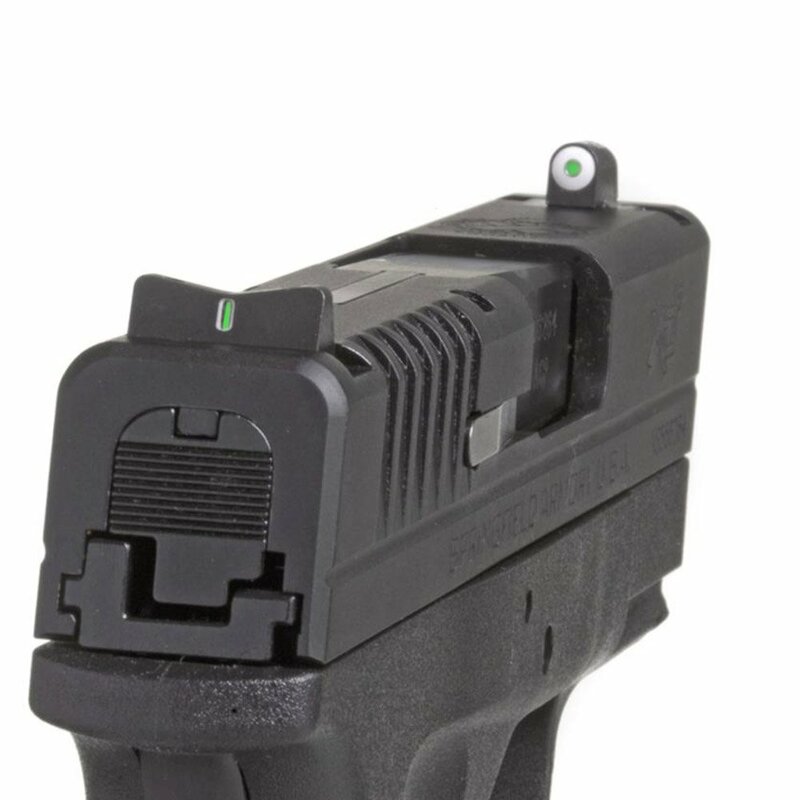 Trusted by both law enforcement and the military the Meprolight Night Sights are an excellent option for those who are more likely to use their weapon at night or in a dark situation, and since the Glock 19 is widely issued to police and security this is a realistic situation. The combination day and night sights are handy, however, can never be as bright as night sights. The Meprolight Glock Tru Dots are simply impossible to beat in a low light situation. The Meprolight Glock Sights are still capable for daylight shooting, and they simply do not stand out as much in bright situations. The sights would work well say in a standard office building during the day, but no so much on a Florida beach in July. The Meprolight sights are easy to install and do not require any serious tools, or gunsmithing expertise. The sights are a standard three-dot variety, that means no additional training or range time is needed to learn how to properly use them. Famed optics maker Trijicon has thrown their hat in the ring for producing a quality set of sights for the Glock 19. Their Trijicon HD Night Sights are designed around the needs of those carrying a weapon for self-defense. These are not competition sights, these are combat sights. Trijicon has made a set of sights that can be used for day, night, and transitional light situations. The Trijicon HD sights features a bright front sight in both day and night time situations. The front sight is circled with a photoluminescent paint for daytime shooting, and a tritium lamp insert for night time shooting. The rear sights are complete with two tritium inserts to provide a traditional three dot style sights. The rear sight has a steeply hooked front surface that can be used and is designed to be used to operate the slide off of a belt, desk, or anything else if you have a disabled hand. Trijicon has brought the same durability it introduced with it’s optics to these sights, and they are truly combat ready. The Snake Eyes sights are something a little different than the usual sight options for handguns. It’s a unique set of handgun sight I have ever seen. in fact I would compare them more to a rifle’s peep sight than an open handgun sight. The rear sight is a circular sight that is filled with Lexan light pipes. This eye catching material is bright and easy to acquire. On the left and right of the ring are two traditional tritium dots found on normal handgun sights. The front sight is a simple green tritium dot on a post style. The Snake Eyes sight you and your Glock 19 to get on target rapidly in a close quarters situation. In a close quarters situation, the ring is simply filled with the target and the user pulls the trigger. For more precise methods, aperature sights are always more accurate than open sights. With the Snake Eyes sights, you get the best of all worlds, day sights, night sights, close quarter combat sights, and precision sights. Glock loves to call their weapons Perfect, and they nearly are. Out of the box, the Glock 19 runs like an absolute champ. It’s reliable, accurate, durable, and easy to use. The main downside is the sights, but since the Glock 19 is so popular the options for sights are outstanding. The best sights for the Glock 19 are those that fit your needs and your situations.